Is screen time interfering with your horse time? As the world becomes more tech-oriented, lots of folks are struggling to put down their phones at dinner, during meetings, behind the wheel–and even in the saddle. In a recent article published by HorseTalk New Zealand, experts explain that multi-tasking while at the reins can be both a safety hazard (reducing your ability to react on if the horse spooks) and may even have an emotional impact on your horse. The relationship between horse and human is all about communication, and it may be foolhardy to think that the horse doesn’t know when you’ve mentally checked out. It’s also not necessarily the best practice to leave the phone in the car (although we’ve been known to do so, just to get away from the screen for a bit)–having a connection can be crucial if you or your horse becomes hurt during your ride, or if you’re doing trail riding, especially alone. It’s almost Oct. 31, and a lot of local trail rides and three-day events are adding costume classes for those of us who refuse to admit that we are no longer an appropriate age for trick-or-treating. Out of curiosity, we’ve spent a LOT of time in the past few days Googling costume ideas for horses (we have such a tough job). As if his costume weren’t impressive enough, Cloudburst is also a mini therapy horse for Gentle Carousel. 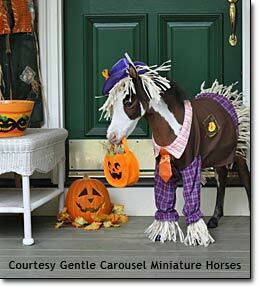 If you’re thinking of dressing your horse up for Halloween, it seems there are a couple of different approaches. Some Internet-famous costumes are intricate custom jobs, while others are do-it-yourself modifications of blankets, polos, saddle pads, and other items you might have lying around the tack room. While we don’t advocate for one approach or another, there are probably a few things you should keep in mind as you dream up your horse’s get-up. Make sure you have good visibility in your costume, provided you’re also dressing up. Keep an eye on that candy–while peppermints are fine for horses, the ingredients in other candies may or may not be safe for them to eat. Probably safest to keep them out of your Halloween basket altogether. Give your horse LOTS of hugs and cookies for once again patiently putting up with strange human holidays. We can help you with part of your costume–our war bridle has a great dramatic look for uses in costumes and parades, although lots of our customers love using it every day, too. …that is the question many of us are asking ourselves as the weather begins to get colder (in between shrieks and wails every time we step outside in short sleeves and get goosebumps). Like everything else in the horse world, there is more than one school of thought on this, and more than one way of doing it, if you choose. For one thing, it will depend on your horse and his living conditions going into winter. Where we are in central Kentucky, some horses are already developing a really thick coat, while others are clearly growing in a new hair pattern but they’re not too wooly yet. Whether or not the horse stays inside for the coldest part of the day, and whether they’ve been wearing sheets the past few weeks could partially influence this, although the change in coat length is more commonly thought to coincide with changes in day length. If you plan to limit your riding to a few bouts of light work during wintertime, and your horse is going to live outdoors unblanketed, it might be better to skip the clippers. If you’re going to remain in training through the season though, and if you’re well-equipped with horse clothes to compensate for a shorter hair coat, it might be worth considering. A full or partial clip can help the horse cool off faster–when they sweat into a longer coat, it becomes more difficult for the heat and moisture to move away from the skin, slowing the cool-down process and running the risk of a chill. There are several clip patterns that are used for horses in different types of work, many of which leave longer hair on areas that don’t trap as much heat, or on legs for hunting/trail horses. If you’re like us, you might be tempted to do a little neatening of your horse’s whiskers or chin while you’ve got the clippers out anyway. If you do, remember that our grooming halters make this task easier by eliminating the chin piece, and also rinse clean of all that horse hair. How can I be sure that I’ll love the size/color I order? Great question. We worry about this too. We encourage folks to test out different sizes on their horses by using our new demo program (which also gives you a chance to try beta biothane, if you’re new to the material). If you love the demo item, you can buy it and yes, that does happen pretty often. We also offer free color samples so you can be sure our colors match what you need before you order. Can you send me the sizing guide for X? We don’t release sizing guides because we’ve found that if we give the measurement for say, the bridge of the nose, someone else might put their measuring tape in a slightly different part of the muzzle from where we put ours. Multiply that by a few different measures and voila! The horse measures as one size and when the tack arrives, it doesn’t fit as neatly as we or the customer would like. Even with photos and detailed instructions, the measurements can still come out differently. This is another area where the demo program can help. If you’d rather not go that route, you can leave your horse’s breed, height, and approximate weight in your Order Notes at checkout. Our tack makers have been at this for long enough that they can modify our standard sizes to work based on those physical characteristics. Why is there a materials charge for returned/exchanged goods? We pride ourselves in making each item to order, but the flipside of not being a big warehouse store is that if someone needs a new size or color, it’s not just sitting on a shelf somewhere…our craftsmen and ladies have to make it from scratch. Then, we have the returned item to contend with. There are literally thousands of different size/color/hardware/pattern combinations between all the products we offer on our website. It could truly be months (or maybe even years for odd sizes) before someone else comes along who wants this exact variant, and in the meantime the returned item has got to take up space that could otherwise be used for more raw materials. If the item needs minor adjustments, we might be able to modify the item you’ve got, enabling you to skip part of the materials charge. Also check out our replacement parts page to see if there’s something there that could help. And, don’t forget, a leather hole punch will work on beta if you need to add holes. What if I need to return, exchange, or repair something anyway? Please give us a heads-up before you put the item in the mail so we know what to do when it arrives on our end. You can find our contact info here. This week, we continue our Meet Our Breeds series, in which we introduce you to the equine models who show off our tack on our website. This is Seamus, one of our handsome male models and a Racking Horse. The Racking Horse was developed in the U.S. as a riding horse with the beauty and comfort suitable for transporting people around large farms and plantations. The Racking Horse is typically a light body type, averaging 15.2 hands with a long, elegant neck, full flanks, and sturdy legs. They are great beginner horses for both riding and driving. The breed’s “rack” is its own additional gait which has four beats as each foot strikes the ground at a different time. The Racking Horse has this gait naturally and does not require special training to learn how to do it. The Racking Horse Breeders’ Association of America has 80,000 registered racking horses in the United States. Seamus here belongs to Liz S. in Versailles, Ky., where he is both a great under saddle and driving horse. Liz is part of the Kentucky Mounted Patrol, which works with local, state, and federal first responders to aid in emergencies in situations where vehicles and on-foot personnel cannot.